As the first in a series of new tasting menus, Roast Restaurant in Borough Market (famed for their roast dinners, unsurprisingly) ran a ‘Horn to Hoof’ menu throughout February. Using beef that’s exclusively sourced from Sussex-based farmers, the menu was devised by head chef Stuart Cauldwell not only to showcase the impressive breed of cattle, but to celebrate the cow in its entirety. Place the ox cheek into a bowl with the Guinness, garlic, thyme, and bay leaf. Cover and marinate in the fridge for two days. Drain the meat in a colander, reserving the marinade, and dry the pieces of ox cheek with some kitchen paper. Lightly flour the meat, season with salt and pepper and fry a few pieces at a time in a heavy frying pan until nicely browned before removing from the pan. Heat the butter in the same saucepan and lightly caramelise the mirepoix (onion, carrot, celery and leek) for a few minutes until golden. Add the flour and tomato puree and stir over a low heat for 2 minutes. Slowly add the marinade stirring constantly to avoid lumps forming. Bring to the boil and simmer until it has reduced by half. Add the meat stock and the ox cheek, bring back to the boil. Transfer to a deep braising tray, cover with a lid or foil and braise in the oven for about 3 hours until the meat is tender. It’s difficult to put an exact time on braised meats, sometimes an extra half an hour may be required depending on the meat itself. The best way to check is by actually tasting the meat. Break up the ox cheek into the thickened sauce to serve. Clean the scallops – the roe can be used if you wish. Place the carrots in a saucepan and cover with chicken stock and whipping cream. Bring to the boil, reduce to a simmer and cook for around 6-8 minutes until soft. Drain the excess liquor and place the warm carrots into a food processor. Purée until smooth, adding a little of the reserved liquor as required. Stir in the mustards to taste. Combine all ingredients and drizzle over the scallops. 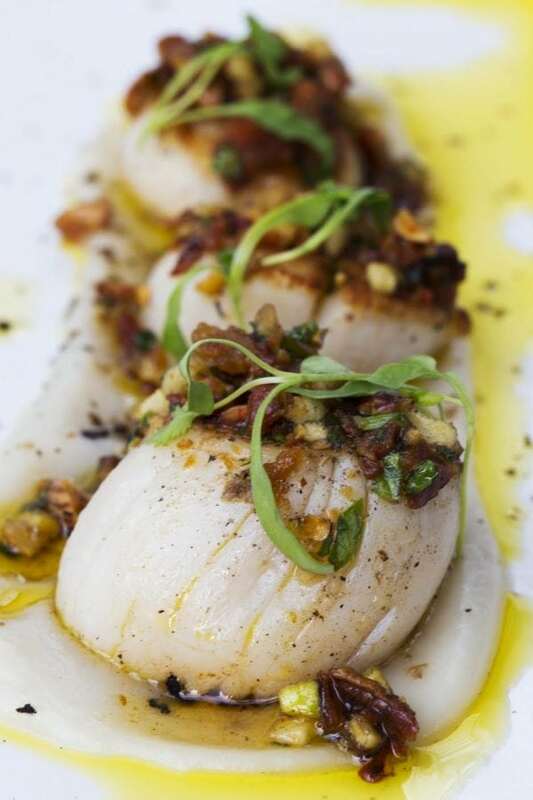 Smear some carrot and mustard purée on to the plate, then top with the scallops that have been drizzled with the hazelnut and sage dressing. Finally, top with the braised ox cheek and a drizzle of the ox cheek sauce before serving. Further information on Roast Restaurant can be found at roast-restaurant.com.